When a friend once gave me a small cutting of her favorite succulent, I stuck it into some soil, and to my joy and surprise, several months later I had a thriving plant! Our Fisherman’s Rib Hand Warmers are also an offshoot of a much larger project, our Top-Down Shawl Collar Cardigan. 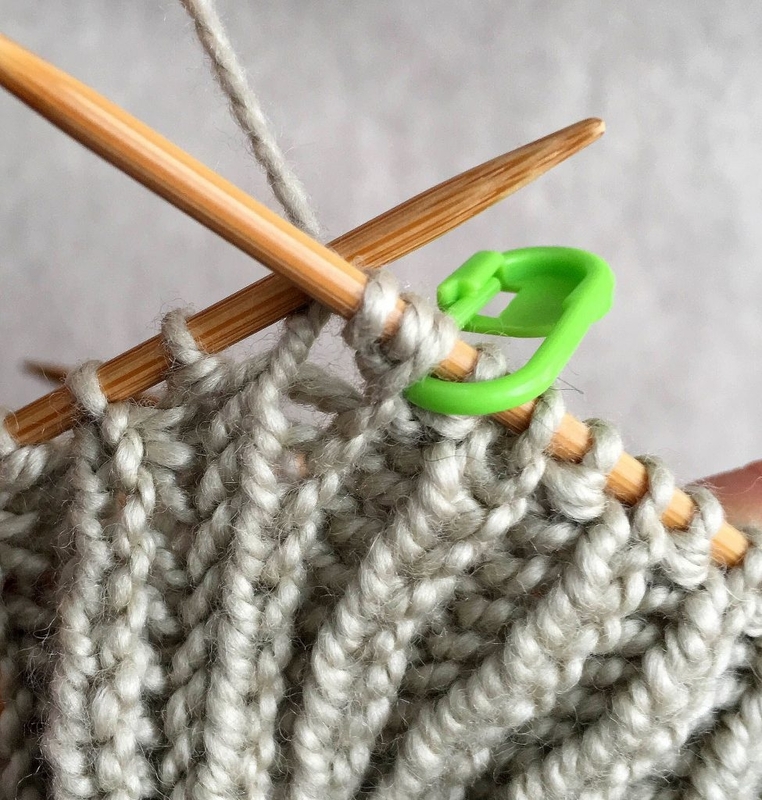 While working on the cardigan, I realized how easily a series of increases in Fisherman’s Rib could gracefully blossom into a thumb, and so, our Fisherman’s Rib Hand Warmers were propagated. Knit in a finer gauge than the sweater, for the Hand Warmers, I used Purl Soho’s Mulberry Merino, an elegant merino wool and mulberry silk blend. The gentle sheen and softness of the yarn, along with the density of the stitch, make these Hand Warmers very satisfying in their own right! 2 skeins of Purl Soho’s Mulberry Merino, 80% extra fine merino wool, 20% mulberry silk. We used the color Pale Stone. Set-Up Row: *K1, p1, repeat from * to last stitch, k1. Row 1: K1, *k1b (see Notes, below), p1, repeat from * to last two stitches, k1b, k1. Row 2: K1, *p1, k1b, repeat from * to last two stitches, p1, k1. Knit 1 in the row below, but do not take the stitch off the left needle. Make a yarn over on the right needle (in other words, bring the yarn to the front). Round 1: *K1b, p1, repeat from * to end of round. Round 2: *K1, p1b, repeat from * to end of round. Cast on 40 stitches and distribute them over 3 double pointed needles. Place either color marker and join for working in the round, being careful to not twist the stitches. Set-up Round: *K1, p1, repeat from * to end of round. Work Fisherman’s Rib In-The-Round (see Notes, above) until piece measures 7 inches from the cast-on edge, ending with Round 2. TIP: Use two different colored markers to help keep track of which round you’re on. When you begin a new round, change markers. Round 2: K1, p1, k1, p1b, [k1, p1b] 6 times, k1, p1, *k1, p1b, repeat from * to end of round. Work Rounds 1 and 2 of Fisherman’s Rib In-The-Round two times. Next Round: K1, p1b, k1, p1, k1, [p1b, k1] 6 times, p1b, k1, p1, k1, p1b, *k1, p1b, repeat from * to end of round. Next Round: [k1, p1b] 2 times, k1, p1, k1, [p1b, k1] 6 times, [p1, k1] 2 times, p1b, *k1, p1b repeat from * to end of round. Work Rounds 1 and 2 of Fisherman’s Rib In–The-Round two times. Next Round: [K1, p1b] 3 times, k1, p1, k1, [p1b, k1] 6 times, [p1, k1] 2 times, p1b, *k1, p1b repeat from * to end of round. Work in Fisherman’s Rib In-The-Round for 3 inches or to desired length. On a Round 1, bind off all stitches loosely in 1 x1 rib. Place 15 stitches for Thumb evenly onto 3 double pointed needles. Starting with Round 2, work Fisherman’s Rib In-The-Round until Thumb measures 1 inch or desired length. On a Round 1, bind off all stitches loosely in 1 x 1 rib. These are GORGEOUS just like your Fisherman’s Rib Knit scarf which I’ve made and fell in LOVE with this stitch, I got many compliments on the scarf being soft, thick and bulky which was perfect for this Winter weather, I can’t wait to make these thank you for sharing. Is there a way to make these with a seam? I don’t like working with double pointed needles, but the pattern is gorgeous and I’d love to knit up a pair! I’m sorry but we don’t currently have seamed instructions for the hand warmers, and converting the pattern is a bit trickier than it may seem! I can try to provide a general overview of how a seamed version might be worked, although we’ve not yet tested these instructions. You could try casting on 41 stitches and knitting Fisherman’s Rib Flat (provided in the Gauge section of the pattern) for 7 inches, and then on a Row 2, work the first 12 stitches in pattern, place a marker and then in the next stitch, which will be k1b, work your first kyok increase and follow the instructions provided in the Thumb Gusset section of the pattern. The first kyok that you work will be the first kyok in Increase Round 1 in the Thumb Gusset section. The marker can help you keep track of where you are in the pattern and will make it easier for you to follow the increase rows as written in the pattern. Because you will not be working in the round, the rows following your increase rows will simply be worked in pattern (Fisherman’s Rib Flat) and newly made stitches will be worked as either knit or purl stitches (since it won’t yet be possible to work these stitches in the row below). After completing the increase rows in the Thumb Gusset section, you can then place the stitches for the thumb (which will be 16 stitches total and will include all of the increases you just worked), onto waste yarn and connect the stitches on either side of the thumb, working them straight for 3 inches to complete the Palm. You can then bind off the Palm stitches and pick up the 16 thumb stitches that have been put on hold and knit those for an inch in pattern and then bind them off. You will then just need to seam the inside of the thumb and along the side to finish. I hope this helps get you started and we are here to answer any questions you may have along the way. Thanks for writing! thank you again for your great patterns. i love this and will be making a pair for myself! The pattern calls for a UK size 12 (2.75mm). Hope this helps! Thanks for writing! Love the fingerness gloves and cowl.Could I purchase patterns and yarn from you? Thank you so much for writing in! The patterns are free on our blog, you can find the Fisherman’s Rib Cowl here and the Fisherman’s Rib Hand Warmers here. To order the yarn you can visit our online store here or give us a call at (212) 420-8796. Is this color still available ? Next Round: [K1, p1b] 4 times, p2tog, *k1, p1b, repeat from * to end of round. [40 stitches] . Note: these hand warmers are knitting up lusciously, the pattern results in a delightfully squishy and gorgeous fabric. Sorry for the delayed response! We have made this correction to the pattern and appreciate your keen eye! Thanks for taking the time to write in! Could this pattern be knitted with circular needles? I find they are easier for arthritic fingers. I really like the simplicity of this pattern. 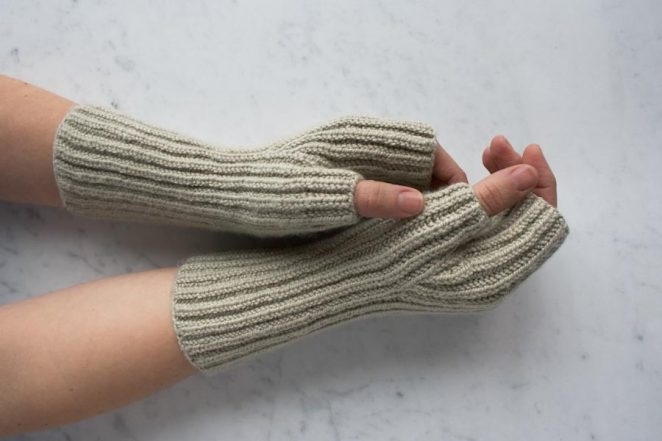 With a particularly small circumference of knitting, like these hand warmers or socks, one way to still be able to use double point needles is with a method called magic loop. This is simply a way to use a longer circular needle and still be able to work a narrow circumference. Although we don’t have specific instructions on how to work this pattern using magic loop, a useful tutorial on how it works can be found here in this video clip here (https://www.youtube.com/watch?v=1mqIqRdJc68) and may provide a good starting point. Please feel free to write back with any additional questions you may have, and thanks for writing! Good afternoon! Can you please provide an Anzula equivalent for the yarn? Also, I do not have size 2 double pointed needles, would size 3 make that much of a difference? Thank you! Thanks for writing us! Anzula Cricket would work well for this pattern. You could use a US 3 needle, but the gauge might be a bit different and the mittens might come in a bit large. 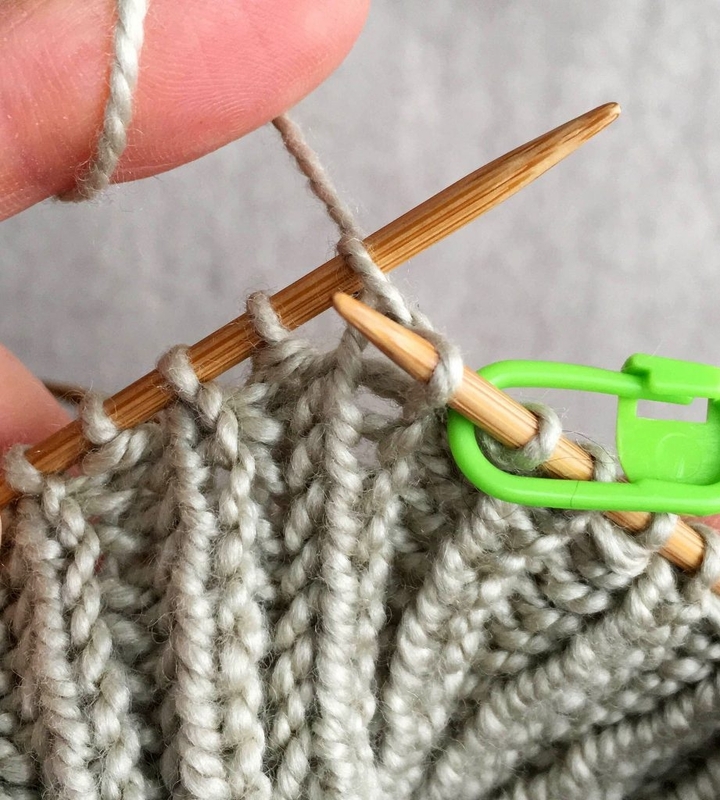 It’s always best to do a gauge swatch if you are planning on using bigger needles. I have provided a link for the Anzula Cricket below. Best of luck to you! 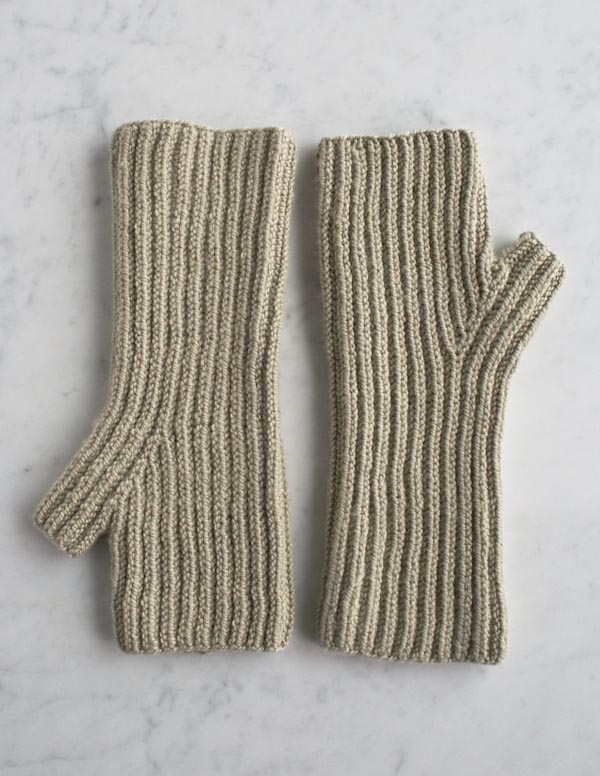 This is will be my first attempt at hand-warmers… I’d like to make 2 pairs – One for me & one for my husband – He’s got larger hands obviously – Would I be able to add on a few stitches & still follow the pattern – More or less? Yes! It would absolutely work to add a few inches to your starting circumference. With a gauge of 6 stitches to the inch, you’ll just want to be sure to add 6 stitches for every extra inch, and have your starting cast on be an even number of stitches. The extra stitches will not affect the shaping you’ll do for your thumb gusset and you’ll simply proceed with the pattern as instructed. Please let us know if you have any questions along the way! Good luck with the warmers and thanks for writing in! that shows how to do this? I’m at the top of the first hand warmer so doing pretty good! Ha Thanks for your help. It definitely can be a bit tricky to correct stitches or pick up dropped ones in Fisherman’s Rib and you not alone in trying to figure out how best to do it! The only thing I can think of that might help is this video clip that shows how to correct dropped K1B stitches: (https://www.youtube.com/watch?v=jrd8MtohamI) The process would be the same in correcting P1B and the clip will hopefully help show you how to fix what you may have done. Please let us know and good luck! Thanks for writing in! Can I use Cashmere Merino Bloom heather for these? My husband bought me 2 skeins in dove gray…hate to return them! Thanks for contacting us. 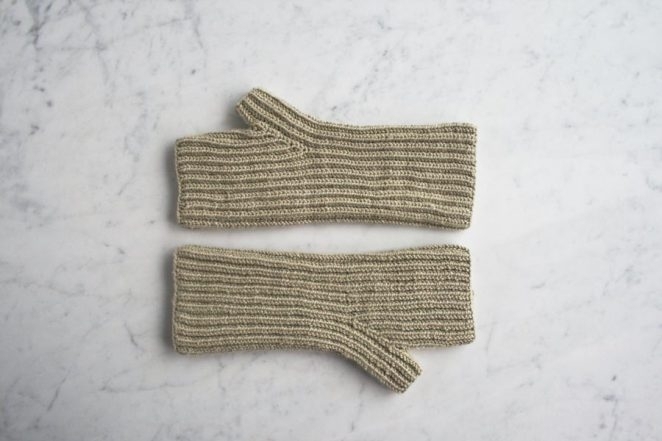 Yes, you could use the Cashmere Merino Bloom for these hand warmers. The gauge might be a touch too big so I suggest omitting 2-4 stitches from the cast on. Good luck and happy knitting! These are knitting up wonderfully except: the “seam” where I change from one round to the next is very bumpy and messy. I’m a fairly seasoned knitter but can’t figure out why this is happening or how to fix it. (I’m not using a marker, so it’s not that.) Does anyone know? Thanks for writing in! It sounds like perhaps you are pulling a little too tight or too loose at the beginning of the row. If you have already knit the hand warmers, I would suggest wet blocking the hand warmers. To do this, fill a basin with warm water and a little bit of Soak wool wash. Submerge the hand warmers and leave them to sit for at least 15 minutes. Squeeze out water without wringing the hand warmers and lay them flat to dry. Wet blocking can do wonders for evening out stitches. 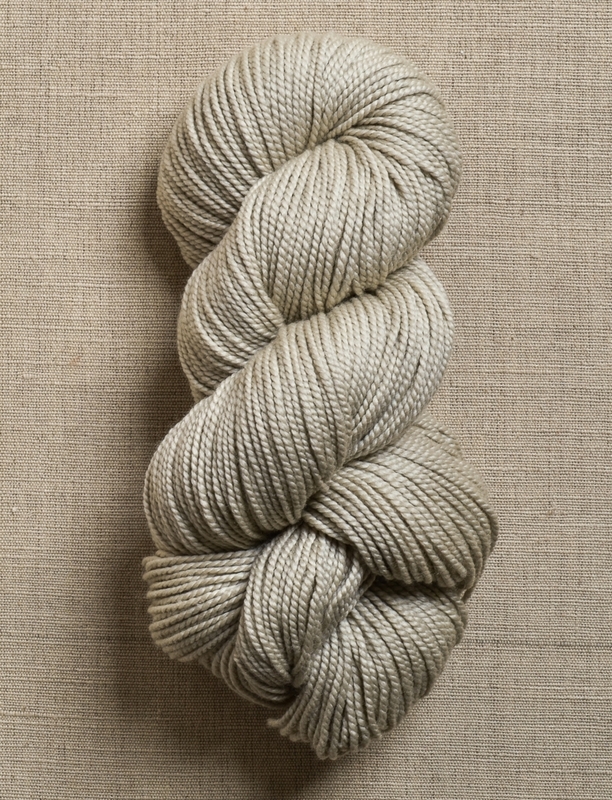 How many yards of the Mulberry Merino is really needed? Trying to figure out if I can substitute your Worsted Twist Heather? 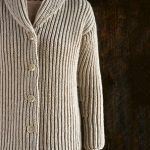 Is Mulberry Merino worsted weight? Thank you. LOVE the pattern. Is this explanation of the K1B the same as for the Fisherman’s Rib Scarf video? Thanks for writing in! We used approximately 345-350 yards of our Mulberry Merino for this pattern. We always suggest that you factor in an additional 10% as your personal gauge may vary in yarn usage. Mulberry Merino is roughly a sport weight yarn and our Worsted Twist is a worsted weight and would not make an easy substitution here. If you would like to use an alternate yarn, you will be looking for one that has a gauge of roughly 5.5 – 6.5 stitches per inch. The video for the Fisherman’s Rib Scarf can certainly be used to help you out with the K1B, it will be the same. Just please note that we are knitting flat in that video and these lovely hand warmer’s are worked in the round! 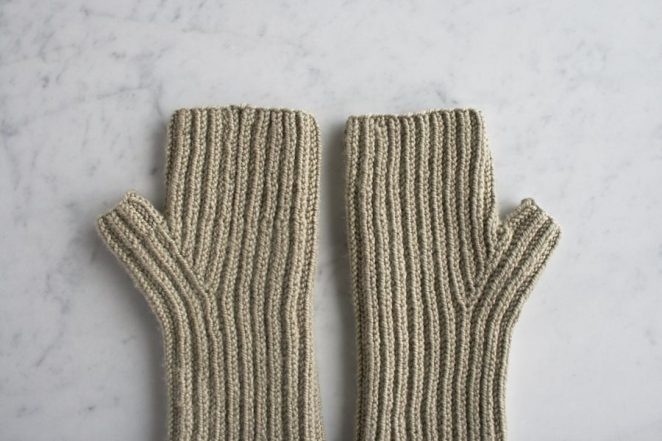 I’m new to knitting, so I have what’s probably a silly question, but: in the “Thumb Gusset” section, when it says “Work Rounds 1 and 2 of Fisherman’s Rib In-The-Round two times,” should that result in a total of 2 new rows (as in R1, R2: “two times, one for each row”)? 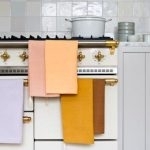 Or should there be 4 new rows (as in R1, R2, R1, R2: “two times apiece for both rows”)? I’m guessing it’s the former, but just wanted to check. Thank you! Thanks for writing in! We are happy to help you out! When it says “Work Rounds 1 and 2 of Fisherman’s Rib In-The-Round two times,” you will work round 1, round 2, round 1 and round 2 for a total of 4 rows. I am confused by this confirmation. Wouldn’t that increase to 48 stitches? 4 stitche increase each row 1 which is done twice. The next instructions show the ending stitch count is 48. Thanks for the question! In this section, you will be working rounds 1 and 2 of Fisherman’s Rib twice. These are straight rounds of Fisherman’s Rib as listed in the Fisherman’s Rib In-The-Round and not the increase rounds. The resulting 4 rounds will not increase the stitch count. 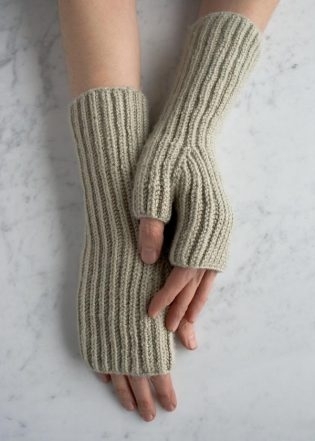 What cast on method would be best for these?I’m rather new to knitting patterns (having always made it up as I went along before learning patterns), and it is surprising how many patterns don’t specify a cast on method, when most DO specify a cast off method. Also, can these be knitted in two colours, to coordinate with the two colour cowl, or will the stitch increases throw the colour changeovers out of line? Great question! For our patterns, unless otherwise noted, we use the long tail cast on. Generally cast ons are not noted unless they are decorative. Here you can use the long tail or the overhand loop cast on. We like the long tail because we think that it makes a neat and flexible edge. 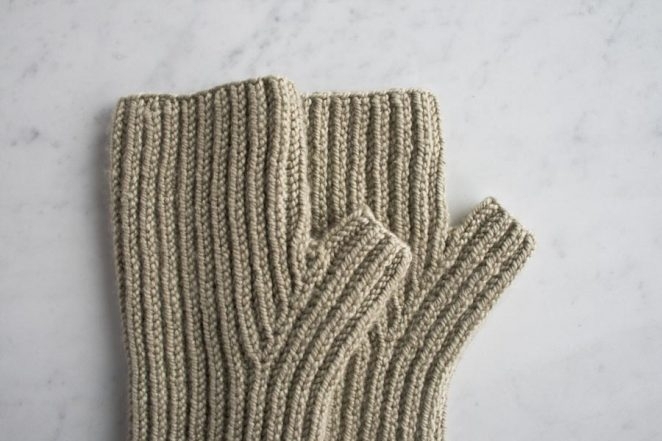 You certainly could try doing a 2 color version of these lovely mitts. I do think that the increases for the gusset will be a bit challenging but if you are up for that challenge, you can give it a go! I haven’t finished them yet, but it also looks as if I’ll end up with totally reversible gloves. Two looks in one-bonus! I am so glad that things worked out! I bet that a two color version of this pattern is lovely! Will two skeins of Mulberry Merino be enough? Do I need to adjust the thumb gusset and give it more room? If so, how would I do that? Thanks for writing in! What a lovely gift! You should not have to adjust the thumb here. The fisherman’s rib is quite stretchy and the thumb should fit almost everyone. I would just be sure to not cast off too tightly at the top of the thumb. Casting off too tightly will tighten up the thumb. I’m a seasoned knitter but mittens scare the daylights out of me because of the thumb. I loved how squishy the fisherman’s rib cowl though, so I’m ready to try this pattern! 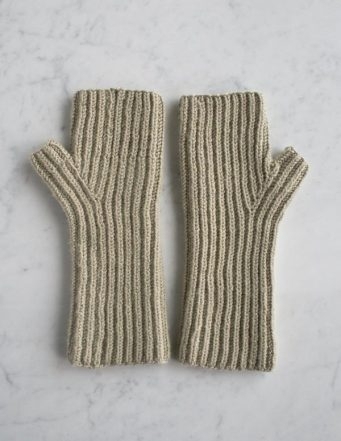 Any recommendations on how to make these into full-blown mittens? I’m thinking of using the same decrease method as my cuff-down favorite sock pattern for the hand and just winging it for the thumb. Thanks, and happy New Years! Thanks for reaching out! No need to be scared of mittens! Thumbs can be a touch fiddly but they are very achievable! 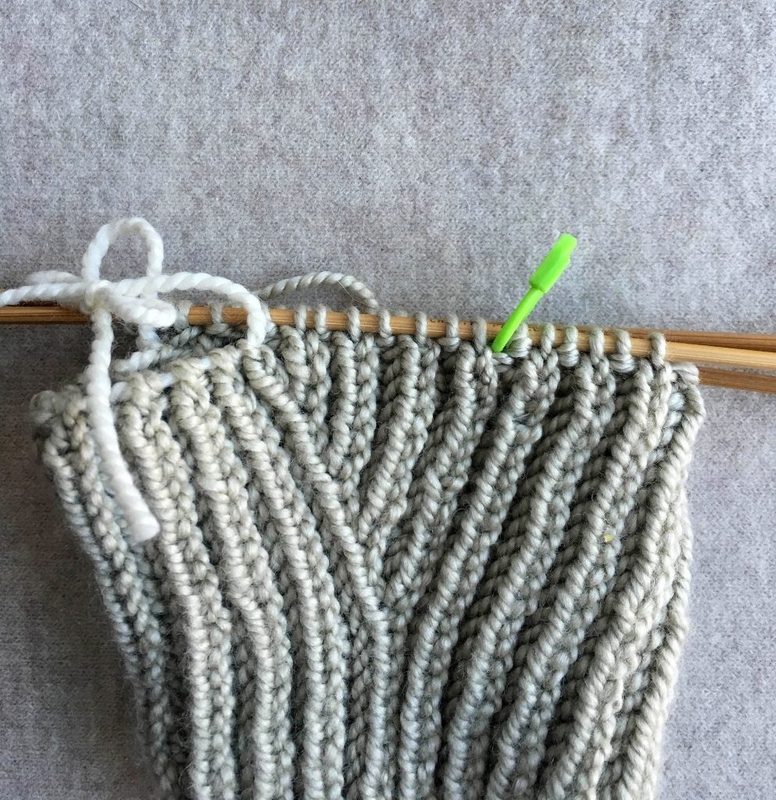 Adjusting this pattern to be mittens will require a fair bit of trial and error as decreasing in Fisherman’s Rib is a but more complicated than in other textures. You may want to look at the type of decreases we used for the Color Dipped Hat and use try them out for your mittens. With some work, I think that you could do it! Thank you for a most interesting pattern. I’ve done 1×1 rib tubular bind off in the past, following Suzanne Bryan’s video, but am not sure if it applies to fishermans rib? If not, could you please advise me of a tutorial or video link? Many thanks! Thanks for writing in and for your kind words! For this lovely pattern, we used a standard pass over bind off in pattern. We do have a tutorial for a long tail tubular bind off for 1×1 rib but we have not used it for fisherman’s rib in the past. You can certainly give it a try! Do let us know how it turns out! Thank you Cassy. I’ll try to be brave, and let you know. When you list your gauge as “6 stitches and 16 rows = 1 inch in Fisherman’s Rib pattern, unstretched”, are you saying that 16 rows will yield 1 inch of length? That you’d see an average of 6 stitches and *16* rows in a 1 inch x 1 inch area? Perhaps I’m misunderstanding that? Thanks for reaching out! 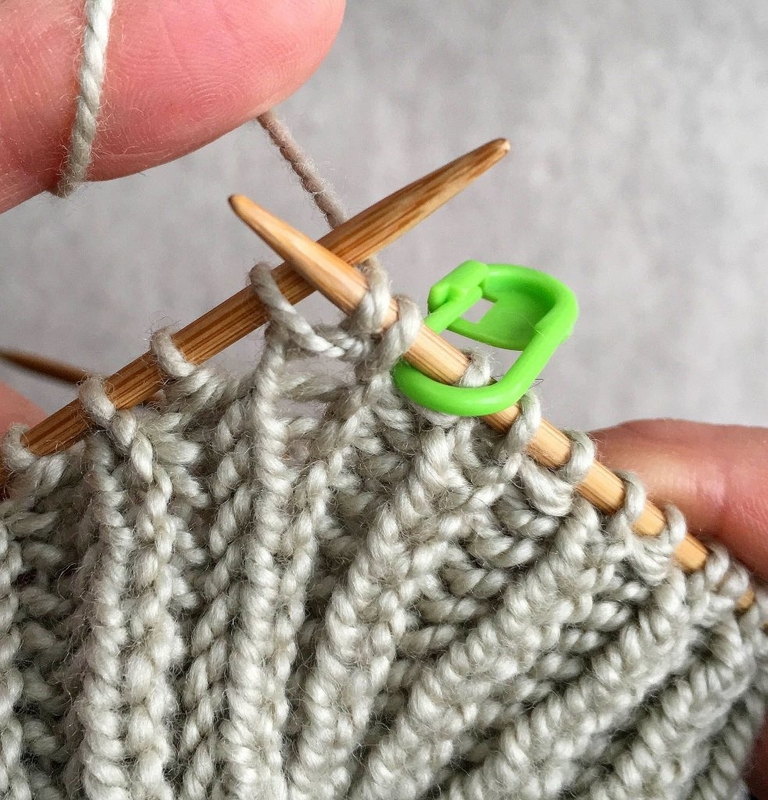 Although it sounds like you need to go down a needle size since you are getting too few stitches per inch, I think you may be counting your rows as if they were ordinary Stockinette Stitch. 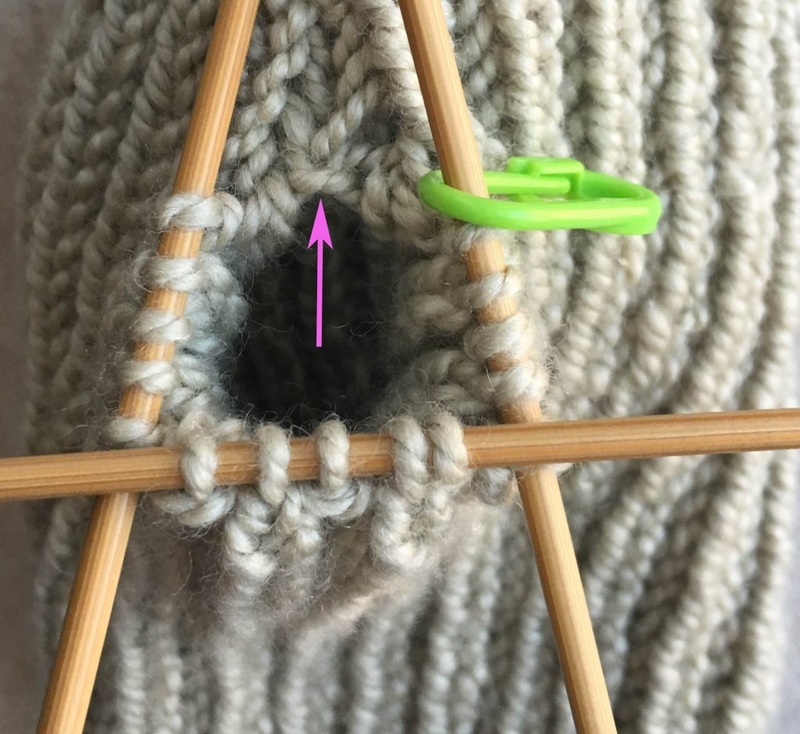 In Fisherman’s Rib, each stockinette “V” in the knit columns actually represents two rows, since you knit in the row below on every other row. I would also recommend counting and measuring a larger area than just one inch – it can be quite hard to spot and account for partial rows and stitches in a single square inch, so it’s much more accurate to count your stitches and rows over four inches and divide by four to figure out your gauge in a single inch. I can’t remember whether that was my comment above…..
but, in other words if I’m counting each “V” as one row, then I can consider 8 rows per inch. Same same. It can be tricky to count rows on unique stitches such as Fisherman’s Rib! If you are getting 8 “V’s” per inch then it sounds like your row gauge is spot on! It was very helpful and I was able to figure out how to get back on track. Do you have any suggestions for adding finger holes to this pattern? To make them more like fingerless gloves and less like fingerless mittens? Thanks for writing in! 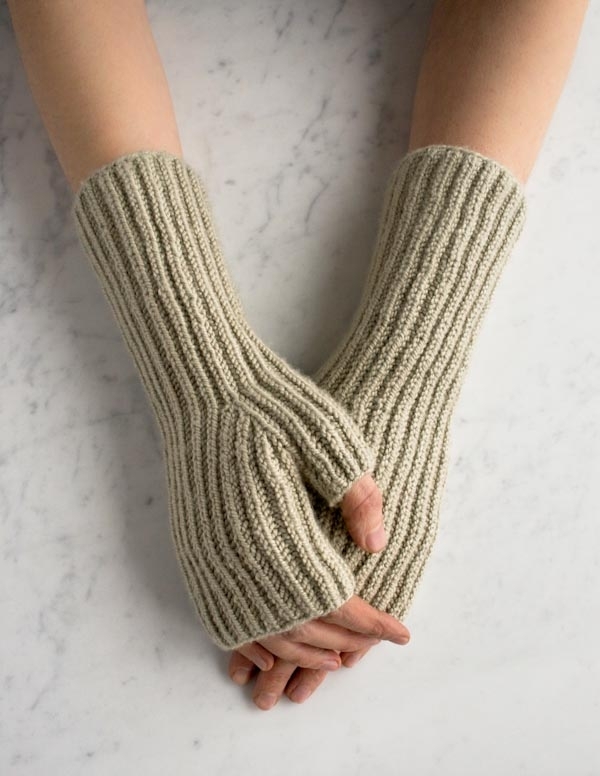 Unfortunately the proportions of gloves with individual fingers can be quite tricky to figure out, especially in a stitch pattern that requires a particular multiple of stitches, so we do not have instructions for converting these to gloves – I’m so sorry about that! If you would like to take a stab at figuring it out yourself, our Cashmere Fingerless Gloves are knit at a very similar gauge, so you may be able to adapt the finger instructions to Fisherman’s Rib.